Order your copy of Fairytale Marketing, authored by measurable marketing pioneer Grant A. Johnson, a powerful book for advertising, branding and direct marketing professionals who are looking for real-life “happily ever after” results. of Fairytale Marketing: in Chapter 9, our hero convinces the powerful potion maker to abandon his award-seeking, old marketing ways. Once upon a time there were two young high school graduates. They were both accepted by good colleges and, coincidentally, chose the same major, marketing. The students did extremely well, finishing in the top tiers of their classes. Numerous job offers were presented to them and their futures looked very bright indeed. Both were intelligent, “Type A” personalities, individuals who worked equally hard. One, however, seemed stuck in a middle management position and was becoming increasingly frustrated, while the other quickly rose in his firm, even in the midst of a brutal and unforgiving economy. As with most careers, certain decisions – turns if you will – had to be taken along the way, directions that typically bolster or ruin advancement within an organization. The struggling middle manager ultimately decided to turn left upon reaching the proverbial fork in road, following the sign marked, “Traditional Advertising and Marketing.” Enticed by the lush foliage and bright colors immediately in sight, it was an easy decision to make. Meanwhile the up-and-coming executive went to the right, choosing the road to, “Direct Marketing,” despite what appeared to be a dull landscape ahead. Now there’s a guide available that can help you, a powerful little book, a business fable about the clearly marked differences between advertising and direct marketing. It’s called Fairytale Marketing. How do you know the simple secrets revealed in this book will really work? They have for companies large and small, coast to coast, business to consumer, business to business and not-for-profit organizations . . . Microsoft, GE, Humana, Omaha Steaks, and many others . . . businesses making more money, better measuring results, and experiencing a greater return-on-investment thanks to the 7 magical discoveries revealed in Fairytale Marketing. Like the story at the top of the page, the author, Grant Johnson had to make a monumental career choice. He was fortunate enough to choose the Direct Marketing path, the measurable marketing course. As budgets tighten, his make-believe tale is more poignant than ever. We’re convinced you’ll find this business marketing fable a valuable chart on the road to ROI-based marketing. Your investment? A mere $14.95 plus $5.00 shipping and handling. That’s just $19.95. Why spend hundreds or even thousands of dollars on “same old” seminars? For less than $20, you could achieve the happily-ever-after results you’ve been dreaming about by following some simple, proven steps. Order your copy of Fairytale Marketing now! © 2010 All rights reserved. 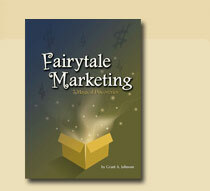 Fairytale Marketing, by Grant A. Johnson, founder of Johnson Direct, a full service marketing agency in Milwaukee, WI.